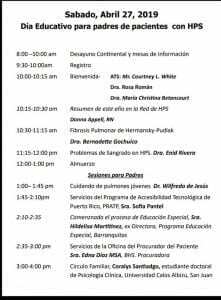 The HPS Network and the American Thoracic Society (ATS) are partnering to offer a Patient Education Day April 27th in Carolina, Puerto Rico. The event will offer information about the pulmonary fibrosis of HPS as well as many other aspects of living with Hermansky-Pudlak Syndrome. The event will be held from 8:00 pm to 4:00 pm at the Courtyard by Marriott Isla Verde Beach Resort, 7012 Calle Avenue Boca de Cangrejos. To register, call: 1 (855) 754-1040.